A delicious way to use up leftover nuuputtu. Separate the strands gently and sun or oven dry before using. Heat the oil in a kadhai or wok and deep fry small batches of the nuuputtu bits at a time. They cook quickly, so work fast and do not allow the threads to colour more than a pale gold. Drain onto absorbent paper, toss with fresh coconut, sugar and cardamom. Serve warm. 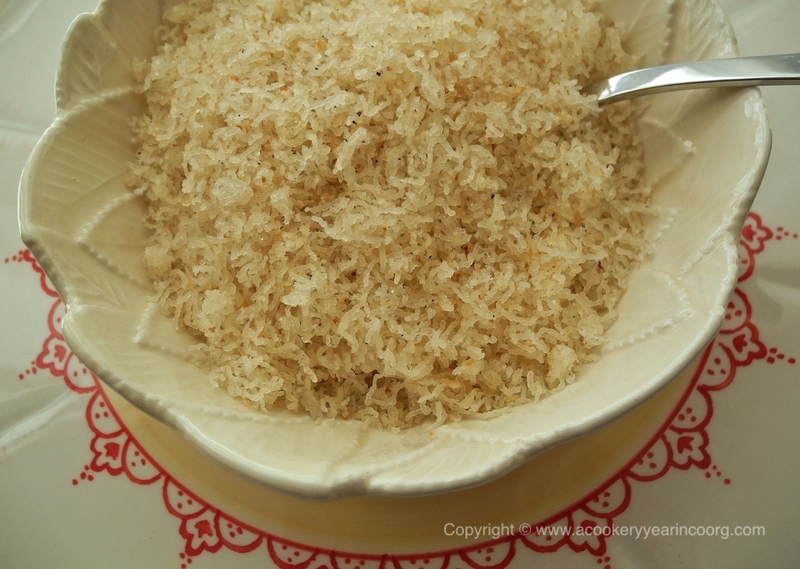 For the version with toasted coconut, you may toast it separately and add it to the fried nuuputtu. Alternately, roast the fried nuuputtu and fresh coconut together gently until the coconut begins to colour and smell toasty. It’s much tastier done this way. Any leftovers can be stored for a few more days in an airtight container.